Thanks to HISS Tank.com Boards Member Gnocchi for posting up the first in-package Images of G.I. 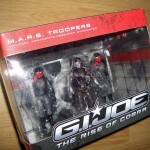 Joe Rise Of Cobra Movie Toys. This now gives us confirmation of the Military Armaments Research Syndicate: M.A.R.S. Troopers 3-PK. ToyArk.com has just received new Images of upcoming G.I. 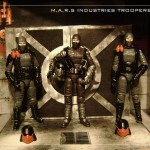 Joe Movie: Rise of Cobra Figures. The new set seems to be a IG/Viper 3 Pack with a M.A.R.S. Playset background. This set has not been Officially named and the contents of this set are subject to change. All times are GMT -4. The time now is 2:17 PM.